The point is made in a piece by John Bolton in this morning's Wall Street Journal. 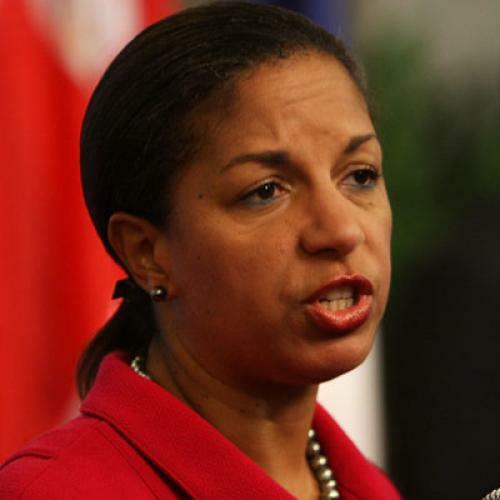 No, not the point about fobbing it off on Susan Rice. But the point about how the U.S. joining up with the U.N. Human Rights Council opened us up to diplomatic defeat after diplomatic defeat. There were two disasters in and around the Goldstone Report. The first was the irretrievable conclusion of the Report that countries and their proper armies (that is, armies according to the Geneva Convention) are actually and factually prohibited from fighting terror groups that meld into the civilian population. Which is what all of them do. In only one dimension does the commission look at both Israel and Hamas equally, and this is to conclude that both are capable of doing their own respectful and honest investigations into the conclusions reached by Goldstone and company. But, alas, this is a joke: imagine Hamas examining itself. It is, however, even more basic than that. One of Judge Goldstone's colleagues on the commission--that is, a jurist of the commission--had already declared Israel guilty before any of its proceedings had even begun. And the highly principled Mr. Goldstone, whom I actually met on a long-ago trip to South Africa, said not one word to her or about her. America's new membership on the Human Rights Council has had no results in the fairness of the process. Did anyone imagine it would? Well, I suppose the president did. And Susan Rice said she did. Look back to my post on Ms. Rice's delusions. The second disaster is the uncontestable demonstration of how empty and vapid is America's influence on the Human Rights Council itself. The president and his U.N. emissary had rebuked their predecessors--George Bush and John Bolton--for leaving the U.N. to its own devices. The new administration would fix that. Just wait and see. Well, we waited and saw. I don't know to what extent the U.S. delegation worked the aisles of the HRC on behalf of justice. And, by the way, justice had only limited dimensions even in the abstract: it would have guaranteed that the little fault the commission charged Hamas with would be contained in the political resolution of the Council itself. OK, that might have taken a bit of effort by the American delegation. But no such work...and certainly no such luck. There are 47 members of the HRC. Twenty-five of them voted "aye," mostly from countries that routinely make war on their own people and the Russian Federation, China and Cuba, big surprise. Five European countries voted "nay." Eleven abstained, including Japan, South Korea and a few other European countries. Five didn't vote at all--among them Great Britain and France--saying that this was, in effect, a vote for Israel. Nonsense. It was, as Bolton wrote in the WSJ, "simultaneously inexplicable and gutless." Mr. Obama has now met the new HRC, same as the old HRC, thus producing a "teachable moment," a phrase he often uses. Quasi-religious faith in 'engagement' and the U.N. has run into empirical reality. When the administration picks itself off the ground, it should become more cognizant of that organization's moral and political limitations. Although it will be hard for Mr. Obama to swallow, the logical response to Friday's debacle is to withdraw and defund the HRC. Otherwise the Goldstone Report will merely be the beginning, next time with perhaps with Washington as its unmistakable target. This will be the easiest of his mistakes to admit. After all, the United Nations is recognized by almost everyone as a comedy. OK, if you will, a tragicomedy.